Allow couscous to stand and cook in boiled water, according to package instructions, and set aside. Halve zucchini and cut into sticks. Finely chop rosemary and halve cherry tomatoes. Flatten chicken fillets and coat them lightly with some flour and the chopped rosemary. Toast cashews without oil in a small frying pan for approx. 2 – 3 min. until golden brown. Heat some olive oil in a frying pan and fry zucchini on all sides for approx. 8 – 10 min. until tender. Remove from pan and set aside. Add a little more oil in the same pan and fry chicken in it for approx. 2 – 3 min. per side until golden brown. Season with salt and pepper and sprinkle with some lemon juice. For the vinaigrette, combine olive oil, vinegar, mustard, honey, and salt and pepper. 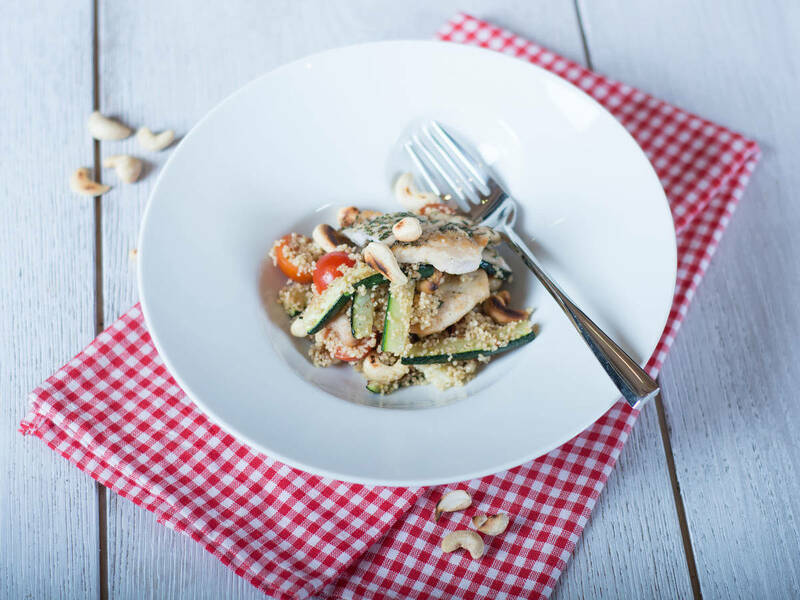 In a large bowl, toss couscous with zucchini, tomatoes, arugula, and cashews. Dress with vinaigrette and serve with sautéed chicken on top.